The U.S. Air Force's fourth X-37 space plane mystery mission will launch into space atop an Atlas V rocket on May 20, 2015 from Cape Canaveral Air Force Station. It is the fourth secret mission for the classified military space plane program. The United States Air Force's X-37B space plane and a tiny solar-sailing spacecraft will launch into orbit today, and you can watch the liftoff live. 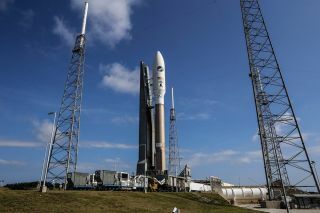 The unmanned X-37B spacecraft is scheduled to blast off atop a United Launch Alliance Atlas V rocket today (May 20) from Florida's Cape Canaveral Air Force Station, during a four-hour launch window that opens at 10:45 a.m. EDT (1445 GMT). You can watch the launch webcast live via United Launch Alliance, or via Space.com partner Spaceflight,Now. Coverage begins at 10:45 a.m. EDT (1445 GMT), with the launch window extending through 2:45 p.m. EDT (1845 GMT). Space.com will carry Spaceflight Now's launch feed here. The Atlas V is also carrying 10 tiny "cubesats" to orbit, including one called LightSail, which was developed by the nonprofit Planetary Society. LightSail aims to test key technologies ahead of a more involved solar-sailing mission using another cubesat in Earth orbit next year. Today's launch marks the fourth space mission — known as Orbital Test Vehicle 4 (OTV-4) — for the reusable X-37B space plane, which looks a bit like NASA's now-retired space shuttle. The X-37B is much smaller, however; two of these robotic space planes could fit inside the shuttle's payload bay. Details about the X-37B's activities are classified, as are most of its payloads, so it's unclear what the space plane will be doing on orbit or how long it will be aloft. But Air Force officials have long maintained that the vehicle is not a space weapon, stressing that it simply tests technologies for reusable spacecraft and future missions. The Air Force owns two X-37B vehicles, both of which were built by Boeing's Phantom Works division. The two space planes had combined to fly three missions before today. Those prior flights launched in April 2010, March 2011 and December 2012, and lasted for 225, 469 and 675 days, respectively. LightSail, meanwhile, is scheduled to deploy its 344-square-foot (32 square meters) sail 28 days from now. Atmospheric drag will pull the cubesat back down to Earth two to 10 days after this occurs, Planetary Society representatives say, but the brief mission should show how well LightSail's attitude-control and sail-deployment systems work.